Can anyone provide the source for these statistics? I don’t dispute them but they are always more meaningful if we know where the statistics came from. Thanks. Why? These trends are reliable. In fact, they blow away projections touted by climate scientists about global temperatures and sea levels. Talk about propaganda. Thanks for writing. And abortion? I clicked and searched through each of the links and didn’t find the source for that projection. It is extrapolated from data from the Alan Guttmacher Institute that projects that 88,166 take place each month in the U.S. 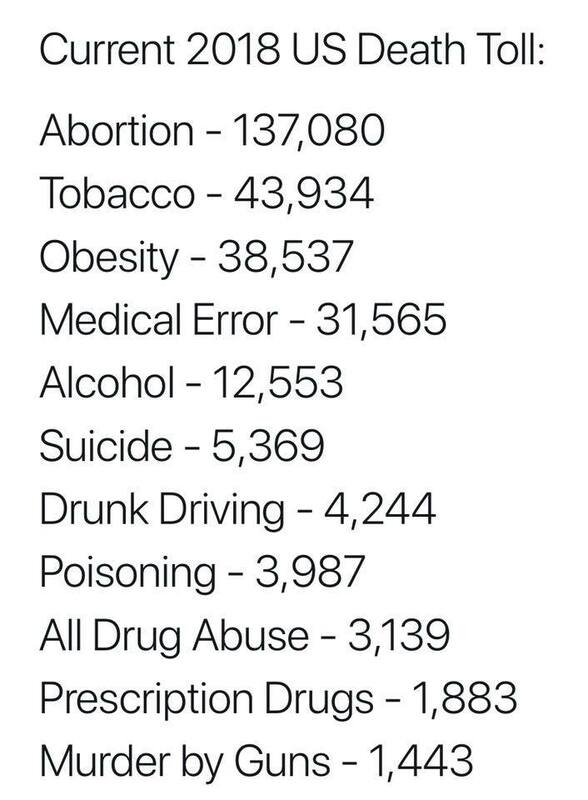 Interesting, all of those figures apart from “murder by guns” are self-inflicted by choice or accidental causes of death. The number of accidental deaths by guns also need to be added to this total. Interesting what is at the top. Also MOST of the gun murders are done w/ hand guns. I dont think its the AR-15 thats killing Chicago and Baltimore. So I guess the hand guns have to go. A guy killed more than 90 w/ a rental truck in France. I guess those rental trucks have to go. More are killed w/ bombs made w/ pressure cookers and nails. I guess pressure cookers and nails have got to go. The federal building was taken w/ a truck and some fertilizer. I guess fertilizer needs to go. That one guy killed a LOT w/ a knife; so knives have go to go. Where does it go? I believe the 1st murder was committed w/ a rock, so we need to pick up all those rocks and get rid of them. I think what is true is that anything can be used to kill a human, however it is a good mental motivator for someone with anger issues and hate to have easy access to a firearm, to simply pick it up, point and shoot. No need for them to even get blood on their hands and being a lover of guns, what other weapon would they think of, or have been more suitable? Often this obscene choice to kill is a domestic issue made in the heat of the moment, but afterwards there is usually many regrets. If the potential shooter had been made to pay fees to obtain background criminal and medical checks, undergo official training tests and obtain the appropriate weapon and user licences to own and use a firearm and had to have the weapon safely locked away by law within a specified security safe when in the home would in many cases be beneficial. The regulations, costs and personal checks may have prevented the purchase of a firearm, or if the firearm owner had passed the vetting system the safe would have restricted the potential shooter and killer to instant firearm access, assuming the weapon was legally kept in the safe at the time. If so, it may allow the potential shooter time to reduce their rage and think about their actions and giving extra time that may allow the potential victim to escape. The guy w/ the truck killed more than the guy in Vegas. NONE of these was a momentary thought. These were all well planned in advance. A rental truck is faster, easier and cheaper to get. We dont even have to worry about how to transport and set it up. I have harder time walking down the block w/ a rifle than driving down the street w/ a truck loaded w/ fuel and/or explosives. Every weapon I listed was used and planned for a while and was cheaper to get and use. They (except the rock) have all killed large groups of people AT least as quickly as the AR-15. So if my nanny gvt is going to keep me all safe and happy from my fellow humans, all knives, hand guns, rocks, trucks, pressure cookers, nails, screws, and fertilizer have got to go. Bats should go too. Lets get rid of wrenches too. Remember a guy took out a gvt building in Oklahoma using a truck and fertilizer. None of that required any background check or waiting. Same goes for the knives. Those bats ANTIFA are swinging at conservatives’s heads don’t have background checks or waiting times. I cant stop gvt overreach w/ any but a semi auto high caliber rifle. You do you and let America do America. No one is trying to bring their gins to your shores and you need not fear the guns here. Its a long way to here. You aren’t likely to be harmed by a conservative’s gun from America. You like the whole gun ban thing you have going on, and that’s great. Our gun rights have zero to do you or any one else living anywhere but here. Canadians might, and I dont hear them. They have their own laws they like and we dont comment either.